Rain Design's popular mStand mobile now has 4 colors: silver, gold, space gray and black. mStand mobile stand support your iPhone and free your hand, so you can work comfortably with touching, swiping, typing or simply enjoy a relaxing video chat. 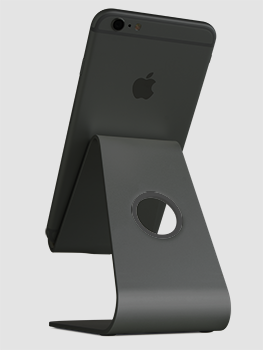 Made of a single solid piece of aluminum with matching iPhone's sand-blasted and anodized finish, the mStand mobile fits iPhone with or without Smart Cover/ Case.